Vermont Harvest of the Month is a partnership between Green Mountain Farm to School, Food Connects, and Vital Communities. Learn more about our partners below. 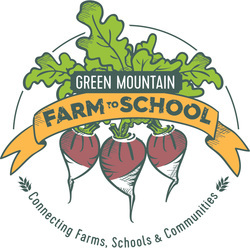 Green Mountain Farm-to-School's mission is to restore and strengthen local food systems in Vermont by promoting positive economic and educational relationships between schools, farms, and communities. Our vision is to build local food systems in Vermont that promote environmental stewardship, create sustainable local economies, and nurture the health and wellbeing of our children and our communities. Cultivating h﻿ealthy food and farm connections in Classrooms, Cafeterias and Communities. Food Connects' vision is for healthy families, thriving farms, and connected communities. Our work is comprised of three core programs: Farm to School, Farm to Community, and Farm to Institution. We are based in Brattleboro, Vermont and work in and around Windham County. Connecting local food and farms to the classroom, cafeteria and community in the VT and NH Upper Valley Region. Through Upper Valley Farm to School Network, Vital Communities supports new and existing farm to school programs in the Upper Valley by providing direct organizing assistance, hosting workshops and forums, and providing resources through the internet and other venues. Addressing the root causes of social and environmental problems. Building philanthropic resources that will sustain healthy and vital Vermont communities now and in the future. VCF was established in 1986 as a permanent source of support for the state. We are a family of hundreds of funds and foundations created by Vermonters to serve their charitable goals. We provide the advice, investment vehicles, and back-office expertise to making your giving easy and inspiring. Together, our funds and programs provide more than $12 million a year in grants in Vermont and beyond.